Vice President Mike Pence (lost in the glare of the lights) came to Spokane Tuesday on behalf of Rep. Cathy McMorris Rodgers. Vice President Mike Pence wowed Spokane Republicans during a 35-minute speech at the Convention Center late this afternoon. 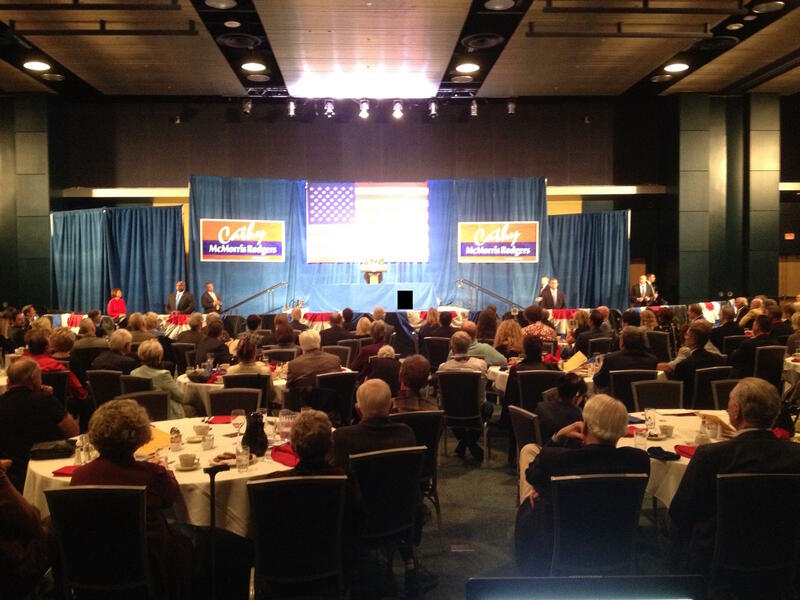 Pence made a brief stop to speak at a fundraiser for Republican U.S. Representative Cathy McMorris Rodgers. “It is great to be here to support a very good friend, someone I’ve admired since she first arrived in the nation’s capital," Pence said. "I’ve watched her career with great admiration and pride. To be able to come here today and say thank you and thank you to eastern Washington for sending a woman integrity, a woman of conviction, a woman of principle and leadership qualities to our nation’s capital. And let me thank you in advance for re-electing Congresswoman Cathy McMorris Rodgers in 2018,” Pence said to applause. Pence talked about McMorris Rodgers’ leadership. He mentioned the new U.S. trade agreement with Canada and Mexico. He talked about McMorris Rodgers’ support of farmers through trade negotiations and the benefits to eastern Washington farmers of the new agreement. He went on to say Trump has signed more bills and rolled back more regulations than any president in history. He talked about America leading the world in producing energy. He talked about the tax cuts signed into law by the president. He credited Republicans for cutting the core out of Obamacare, the personal mandate. He talked about the nation’s low unemployment rate and mentioned that unemployment claims are at 50-year lows. He also credited McMorris Rodgers for her role in bringing more tankers to Fairchild. Then he went on to talk about the difference between the two candidates. McMorris Rodgers’ and Democrat Lisa Brown. As he prepared to leave, Pence asked the crowd to do three things: (1) vote (2) tell somebody about Cathy McMorris Rodgers and (3) pray. With that, Pence left the convention center with McMorris Rodgers and headed back for the airport. He said he’s due back in the nation’s capital tonight [Tuesday].